Welcome to Metalock of Australia Pty. Ltd. 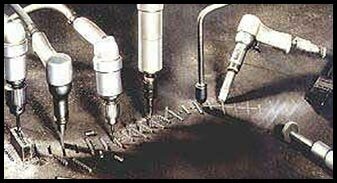 The Metalock process is a unique cold engineering method of repairing fractures or damage to all types of castings. Especially for cast iron/steel as these materials are difficult, risky and costly to repair via welding. We provide cost effective/problem solving through utilisation of leading edge technology and training. Our ability to create innovative solutions and see them through in a timely and responsive manner is your "key to service." Metalock originated in the oil fields of Texas in the mid 1930's to overcome the explosive potential of welding repairs. A system was developed which eliminated heat, and had many ancillary advantages, including the elimination of distortion, which in turn obviated re-machining in most cases. Subsequent development by the U.S.A. defence forces during WWII were responsible for the spread of this technology and its acceptance in heavy industries. Further development in the 1950's led to the establishment of the Metalock International Association. MIA Conferences are held once a year in various parts of the world, so members can update techniques, evaluate R&D and extend the services offered. Technically the Metalock method is very simple. A crack in a cast component is locked using a key which takes up both tensile and compressive stresses. Screws are driven in along the crack in order to take up shear stresses. During the repair the metal actually "flows" with peening to fill the whole of the aperture which compensates for the slight imperfections due to drilling. The keys are very accurately formed to ensure a very good fit in the apertures. It is possible to determine the tensile strength lost when a casting is fractured and we are able to accurately calculate the amount of strength restored by the Metalock keys. The apertures for the keys are prepared at set centers and at right angles to and across the line of the fracture to the exact female form of the Metalock keys. The accuracy of this work relies mainly on the experience and craftsmanship of the Metalock engineer although he does make use of certain jigs and fixtures. The material used in the Metalock process is a corrosion resistant Nickel Alloy. The advantages this material has is its ductility in the annealed condition, giving reasonable tensile strength when work hardened, a low rate of strain hardening and a very low coefficient of thermal expansion, similar to cast iron. Masterlocks are often used in conjunction with the Metalock process, in points of high stress concentration or in sections subject to overloading and subsequent fracture. They are comprised of inlays of high strength alloy plate held in place by dowels, cold worked into matching half holes between the parent material and the alloy plate. The Masterlocks vary in size, shape and even material, dependant upon requirements of each repair.